Garden Bridge faces further uncertainty as new London mayor demands public funding scrutiny Archi-new - Free Dwg file Blocks Cad autocad architecture. Archi-new 3D Dwg - Free Dwg file Blocks Cad autocad architecture. The new mayor of London, Sadiq Khan, has suspended work on Thomas Heatherwick’s controversial Garden Bridge project over concerns that more public money will be required to complete the £175m (US$225.6m, €204.4m) project. Khan officially supports the plans to build the 367m long plant-filled bridge, but only if no more than the agreed £60m (US$77.3m, €70m) in public funding is made available to build it. According to the Architects’ Journal (AJ), the mayor has stepped in to halt a preparatory £3m (US$3.8m, €3.5m) project to strengthen Temple Underground station – which would support the north end of the bridge – while the funding of the work is examined by Transport for London’s (TfL) finance and policy committee. The committee had been expected to approve spending on the project – given the green light by Khan’s predecessor Boris Johnson in March – on 8 July, before the mayor’s intervention. The Garden Bridge Trust – the charity responsible for building and maintaining the Garden Bridge – told the AJ the £3m sum would be repaid under a costs agreement with London Underground, and claimed that progress on the bridge is advancing at “full steam”. Previously, it has said no more than £60m in public funding will be required, and the total cost of public funding spent so far is just under £36m (US$46.4m, €42m). Private sector funding has underwritten the project and the Trust said more than £83m (US$107m, €97m) of private money will be released in tranches when construction begins this summer. The Trust believes the pedestrianised bridge will create transport and economic benefits for London and create a new landmark if it opens as planned in 2018. Critics however believe the area already has enough river crossings and have criticised the procurement process, the amount of public money required and the decision to make the bridge available for exclusive private events. 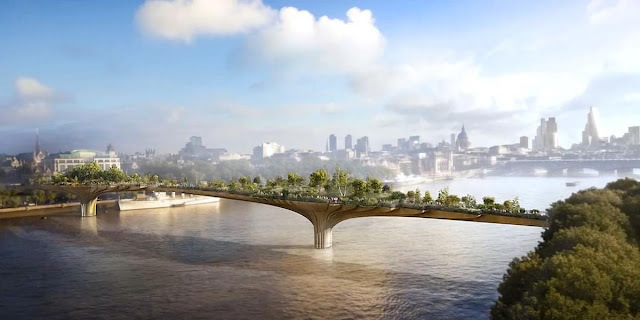 The idea of a garden bridge was first pitched by British actor Joanna Lumley and received strong backing from Johnson before his tenure as mayor ended in May. A joint venture of Bouygues Travaux Publics and Cimolai SpA has been contracted to complete the detailed design, construction and planting of the project, supported by Flint and Neil Limited and Moxon Architects. Heatherwick Studio, landscape architects Dan Pearson Studios and global engineering firm Arup are consulting on the process.